TVXQ's Jae Joong, Yoo Chun, and Jun Su have formed a unit for a series of Dome concerts, but there's more coming from the trio. Find out more about their lives off-stage in the 3THREE VOICES DVD, which features private and behind-the-scenes footage. Follow Jun Su in Sydney, Jae Joong in Canada, and Yoo Chun in Seoul, and hear from them about their activities and experiences during this time. 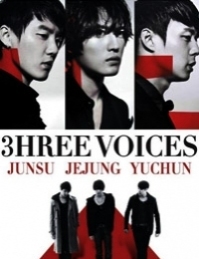 A must-have for fans, the 2-DVD set totals to around three hours of Jae Joong, Yoo Chun, and Jun Su footage.